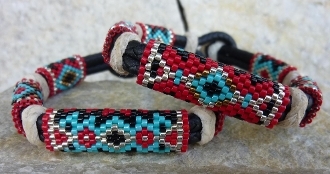 Our Products >> Hand beaded Bracelet " Navajo "
These hand beaded bracelets are reversible with one design on the front and a different design on the back. This is our Navajo design that comes in turquoise, red, black and yellow. Hand beaded Bracelet " Navajo "